With its musical approach and impressive results, Liquid Notes succeeds in enabling deep harmonic manipulation of MIDI arrangements. Works brilliantly, particularly with electronic music. Easy to use. A MIDI-manipulating "songwriting assistant" that works standalone (importing and exporting MIDI files and playing them back using its own built-in synth) but can also be easily coaxed into outputting MIDI to your DAW or soft synths, Liquid Notes uses an intelligent analysis engine to offer a controllable range of alternatives to all the chords and harmonies in an arrangement, be it just a sketch or a full-on track. "Liquid Notes' analysis engine offers a range of alternatives to the chords and harmonies in an arrangement"
With your MIDI file loaded (or DAW connected), Liquid Notes instantiates a series of control sliders, representing the progression of chords throughout the piece, with the highlighted sections at the bottom of the controller strips indicating where the chords sound best as determined by the AI. To change the chord at a given point, simply drag the slider. The further each slider is pushed upwards, the more unconventional its chord becomes, moving progressively further away from its 'balanced tonal centre'. All of the chords in Liquid Notes are connected, so adjusting one might well change the harmonic context of the next, moving its controller to a new position in order to fit the progression, although not changing the chord itself. You can add tension notes to chords by holding down Alt while dragging the controllers, and choose between Tonic, Dominant and Sub-dominant chord 'functions', both adding further variation to what is already a pretty expansive system. There's also LN Live mode, in which input MIDI notes (from QWERTY or MIDI keyboard) are snapped to the note grid of the selected Target Scale. In terms of usable results (and it's easy to get unusable ones if you want to!) Liquid Notes doesn't throw out anything particularly complex, although that probably makes it more relevant to the more grounded harmonic approach of electronic music. It's easy to use, too, considering the fact that it really wants to be a MIDI plugin, which clearly isn't possible given that there's no standard cross-platform format for such things. 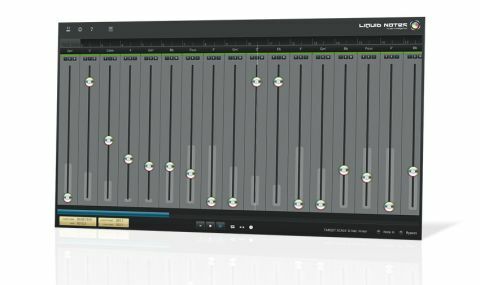 Ultimately, with its musical approach and impressive results, Liquid Notes succeeds in enabling deep harmonic manipulation of MIDI arrangements, although the high price will put many potential users off.